Available in two sporty designs, a 4-door sedan and 5-door hatchback, the 2015 Chevrolet Sonic in Phoenix is fun to drive, feature-packed and perfect for the mileage-minded consumer. Designed with control and comfort in mind, the 2015 Sonic improves on the previous model year with newly added engine options, a refined cabin, Gen. 10 OnStar� service, and new wireless internet capabilities like 4G LTE and Wifi for today's tech-savvy car owner. Truly a car you'll love to drive everywhere you go, every day of the week, the new 2015 Sonic is ideal for both the city and country roads. Our 2015 Chevy Sonic review found this subcompact to be the most versatile, efficient and stylish subcompact car you can buy. 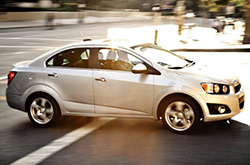 The Chevy Sonic features unbeatable style and versatility for any road ahead, and with improvements to this year's model, there's no better bang for your buck in the popular 2015 subcompact class of vehicles. With a conventional 1.8-liter four-cylinder engine standard on the base model trim and an optional turbocharged 1.4-liter four-cylinder on the LTZ & RS, the 2015 Sonic has a powerful engine to size ratio, making for a quick and sporty ride. Strong acceleration from either engine options allows for a great feel and nimble control with greater gas-mileage ratings than the competition. The 1.8-liter is offered on the LS and LT trim levels, while the LTZ and RS boasts the Turbo 1.4, however both engine options for the 2015 Sonic deliver great mileage for both city and highway driving. Phoenix drivers will love the variety of different body styles, trim levels, engine options and new-age technology of the new 2015 Chevrolet Sonic. 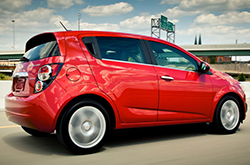 For more detailed research and inventory listings of the 2015 Chevy Sonic in Phoenix, we have gathered interesting videos, detailed specifications and more below so you can find out for yourself why our 2015 Chevrolet Sonic review clearly shows it is the best 2015 compact car on the market. Compare Chevrolet's latest model of the Sonic to its rivals and we're more than confident that you'll choose it over vehicles like the 2015 Honda Fit, Nissan Versa, Mazda 2 and the Ford Fiesta. You'll love the Sonic's long list of terrific qualities, including its low sticker price and useful cabin features. Compare its price against the vehicles in its class and you'll surely see that it's a fabulous value, which makes it a first choice for many Phoenix Chevrolet customers. Check out our Quick List below this text for more information! 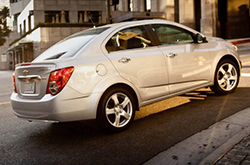 If you're having difficulty deciding which Chevrolet is right for you, please read the Sonic review above, along with reviews of other current 2015 models sold at Midway Chevrolet. We take our job to provide the best reviews written by automotive experts - it's just one more thing that makes us a foremost Chevrolet retailer in Phoenix. Once you begin reading, you'll find that this article is overloaded with vehicle specs in a format that's easy to read. Use it to get the info you need to make an smart purchasing decision. Now that you've checked out Midway Chevrolet's Sonic review, please reach out to us to schedule a test drive or learn about current financing offers and incentives.